As I write this review, I'm listening to "Award Tour" and nodding my head like I'm front row for A Tribe Called Quest's 1993 Arsenio Hall performance under lavender stage lights. I discovered Tribe in a different world than Hanif Abdurraqib: not in Columbus, Ohio, but Akron; not on cassette tape, but a Greatest Hits CD stolen from the public library; not as a black teenager realizing that Tribe's jazz-imbued hip-hop is acceptable to play at home, but as a white 15-year-old suddenly on a mission to become a true-school turntablist in an environment where such a dream was laughable. Fandom aside, this book is on point. 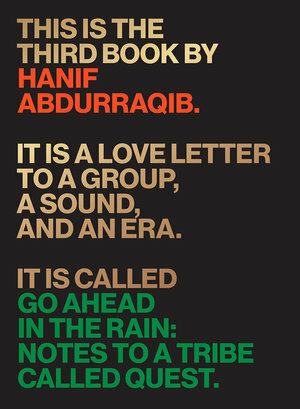 In Go Ahead in the Rain: Notes to A Tribe Called Quest, Abdurraqib blends his talents as both culture critic and personal essayist for a meditation on perhaps the most influential hip-hop group from the genre's sample-laden boom-bap era in the early to mid-'90s. The book opens with the music of African slaves who "would use drums to communicate with each other, sending rhythmic messages that could not be decoded by Europeans" and then offers a short history of jazz starting with New Orleans cornet player, Buddy Bolden. Abdurraqib's wide-panned establishing shot, tracing the lineage of black music as far back as the 1600s, is ambitious, but appropriate since Tribe were outspoken advocates of Afrocentrism, constructed their brand of hip-hop from classic jazz samples, and perfected the most popular genre of black American music around during their short-lived heyday in the '90s. Abdurraqib follows the chronology of Tribe's career (also touching on Tip and Phife Dawg's solo albums, Phife's passing, and the unexpected reunion album in 2016), but isn't interested in writing straightforward history. Instead, he opts to muse on subjects as far-ranging as the New York City blackout of 1977, Jet magazine publishing the photograph of a drowned and frozen Otis Redding, the squandered talent of Tribe's fellow Native Tongues crew member Chi-Ali, and the dense turmoil of Bomb Squad productions. You Want It Darker (Columbia, 2016) the album Leonard Cohen released weeks before his death, is linked with Phife's rhyming on Tribe's last record, We Got It from Here… Thank You 4 Your Service, which was released after his passing. The tenuous connection inspires Abdurraqib to write on the "verses of the dead" and how a recorded ghost "echoes long after the music ends." Interweaved with these tangents are scenes from Abdurraqib's own life, such as failing to play the trumpet in middle school and losing his wallet on a road-trip in a setting similar to Tribe's "El Segundo". The most moving sections, though, are Abdurraqib's letters to Q-Tip, Phife, Ali Shaheed Muhammad, and Phife's mother, renowned poet Cheryl Boyce-Taylor. He admits to Q-Tip that for years he wrongly blamed him alone for Tribe's breakup. In another letter to Q-Tip, he discusses the beating of Rodney King and Tribe's subsequent album, 1991's The Low End Theory, thanking Tip for "knowing the type of political album that the world needed at the time: one that wrapped its politics in ideas of a type of freedom" and fashioning the rage of black Americans "into a hunt for empathy." He reaches out to Cheryl Boyce-Taylor about the death of her son, sharing his own story of losing his mother as a child. He tells Ali Shaheed Muhammad – the group's DJ, whose presence in the book is lacking – how he danced to Muhammad's post-Tribe group Lucy Pearl "underneath the fluorescent lights of Beechcroft High School's gym during a lunch period sock hop that had no business taking place in an afternoon when some of us had to get back to class right after." Abdurraqib describes how he kissed a girl to their song "Dance Tonight" then "retreated to a classroom that afternoon, baptized in sweat and whatever a teenager imagines as love" and "let the song rattle around in [his] head for hours, tied to the end of countless possibilities." It's during these moments, when Abdurrabiq's inner critic concedes to his inner fan, that the prose radiates with his unrestrained love for the music. Go Ahead in the Rain is constructed like a Tribe album. In the same manner that Q-Tip found ways to make a stack of disparate samples congeal as if they were always meant to fit together, Abdurraqib melds the group's backstory with heartfelt letters, bits of memoir, and an experienced critic's scrutiny to form an unexpectedly cohesive read. However, Abdurraqib doesn't aim to mirror Tribe's musical and verbal ebullience, opting instead for a tone that's often elegiac. Today, on the day you are gone, I hope every bodega and every corner store gave away Kool-Aid by the cup. I hope kids went to stores with their parents' money and walked out with pocketfuls of candy. I want candy thrown from the cliffs. I want candy to rattle off of my roof now instead of the water from the sky while your verses play. I want my people to take better care of themselves, but I wanted a day for us to revel in what you loved, if only for a moment. The book ends in the present day, specifically with Tribe's 2017 Grammy Awards performance, during which the group (sans Phife, and joined onstage by Busta Rhymes and Anderson .Paak) protested Donald Trump's presidency, with Tip closing out the set by chanting, "Resist!" The jump in chronology doesn't feel abrupt, despite this being a book set mostly in the decade of bib overalls and Coogi sweaters, because Abdurraqib isn't preoccupied with selling nostalgia. The vantage from which he dissects Tribe's legacy is rooted in the heritage of black music and delivered from the present cultural moment, making Go Ahead in the Rain, much like Tribe's music, capable of remaining relevant for decades to come.